President Mahinda Rajapaksa and his entourage arrived in Jerusalem in Israel this morning on 08 January as the final leg of the three nation Middle East official visit. 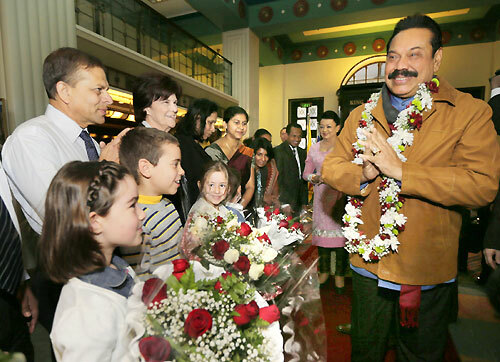 President Rajapaksa and First Lady Shiranthi Rajapaksa were warmly welcomed by Israeli and Sri Lankan children as they arrived in Jerusalem. Sri Lankan Head of State arrived in Jerusalem from Bethlehem. The President is scheduled to hold bilateral discussions today with the Israeli Prime Minister Benjamin Netanyahu. Sri Lankan President will meet his Israeli counterpart Shimon Peres tomorrow and is also expected to plant a sapling for the remembrance of his visit. The President is also scheduled to visit important religious sites in Jerusalem. The President is also scheduled to meet a business delegation of Israeli during the visit. 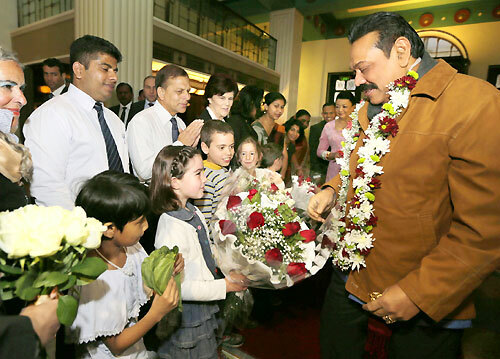 Pictures are seen, Sri Lankan and Israeli children greet President Mahinda Rajapaksa and First Lady Shiranthi Rajapaksa as they arrived in Israel this morning. Minister Prof. G.L. Peiris, Parliamentarians Sajin Vass Gunawardena, Kamala Ranatunge and Roshan Ranasinghe, UNP National List parliamentarian John Amaratunga, Sri Lanka’s Ambassador to Israel in Tel Aviv, Sarath Wijesinghe and his staff members and Israel government officials were present on the occasion.